Ever since the conflict ended, Nepal’s political transition has inexorably concentrated decision-making power in the hands of the alpha males of the three main political parties. The Nepali Congress (NC), UML and the Maoists are the Father, Son and the Holy Ghost of Nepali politics, and their leaders Sher Bahadur Deuba, KP Oli and Pushpa Kamal Dahal have consolidated power both within their parties, and together over the Kathmandu establishment. Reading the headlines in the papers these days it may seem like they are at each other’s throats, but that is an illusion. 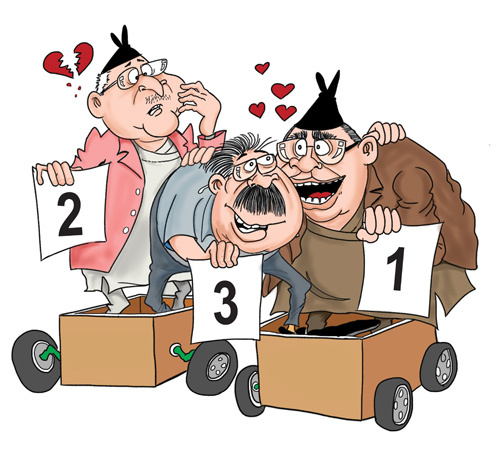 All three work hand-in-glove to preserve and protect their stranglehold on Nepali politics. The 10 governments in the last 10 years have been, in the main, permutations of these three parties. The last four coalition governments after the 2013 elections have just shuffled the cards, with the weakest of the three parties wielding the most clout because of its king-maker role in government formation. In normal circumstances it could be considered a good thing that adversarial parties like the NC and the Maoists can work together even though their leaders, lest we forget, tried to kill each other off not too long ago. But these are not normal times. The farce played out in Bharatpur is an extreme example of the unprincipled you-scratch-my-back-I-scratch-yours brand of politics today: Dahal convinced Deuba to withdraw the NC’s mayoral candidate in Bharatpur and support his daughter Renu. When it looked like she might lose, Maoists tore up ballot papers and later the coalition partners leaned on the Election Commission and the Supreme Court to order a recount. The NC-Maoist combine regrouped and pipped the UML candidate by a razor-thin margin. A sign of the times was the photograph of the Maoist and Congress flags stitched together at Renu Dahal’s victory rally last week. Shameful collective greed and power was also on full display this week in the talks the three parties held about addressing the demands of Govinda KC, who on Friday is on the 19th day of his fast unto death to reform medical education. The kakistocracy has also been hard at work through its MPs to roll back the gains in devolving power to elected local village councils and municipalities by passing a bill in Parliament to limit their revenue-raising powers. In the absence of elected VDCs and DDCs, the three parties ruled the country for the past decade through what they cynically called a ‘Political Mechanism’ – dividing up the spoils so that local budgets went into personal and party coffers. They either control, or influence, just about every other constitutional institution in the country. Public apathy and disillusionment with the political parties, fed by ridicule on social media and the op-ed pages, is at its peak. Time is now ripe for a credible alternative force to rise and challenge this stagnant status quo. Nepali Times brings you the behind-the-scenes people that run Girija Prasad Koirala's office. But, as the landslide blockage showed, the capital is dangerously dependent on just one road in and out.